The EquiMania! Education Centre visits Grand River Raceway August 7. Visit the EquiMania! 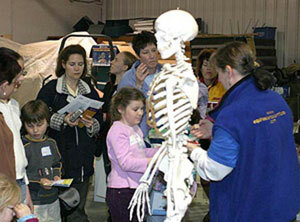 Education Centre at Grand River Raceway on Industry Day, Monday, August 7, 2006. Industry Day celebrates the harness racing industry at Grand River Raceway, attracting racing fans province-wide and beyond. Industry Day began at the Elmira Raceway in 1991. For its 16th year, Industry Day celebrates its third running at Grand River Raceway. Equine Guelph's youth program, EquiMania!, promotes horse health and safety. From the hands-on learning resources, interactive website (www.EquiMania.ca), traveling Education Centre and annual Quiz Challenge, the entire EquiMania! 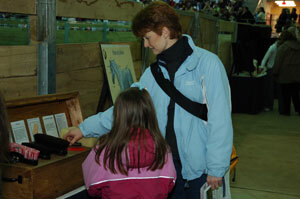 program is overflowing with valuable educational material that focuses on horse health while engaging those taking part. 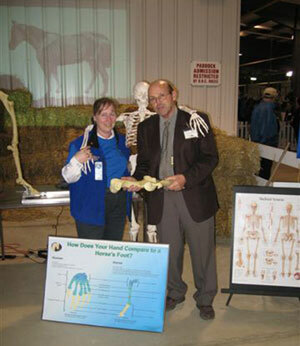 Gayle Ecker, Senior Manager of Equine Guelph, joined in the fun with Dr. Ted Clarke, General Manager of Grand River Raceway (right) at Grand River Raceway’s Horse Racing Open House on May 15, 2006. The EquiMania! 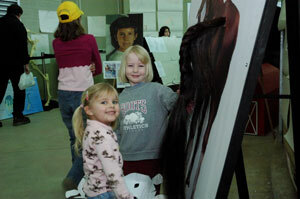 Education Centre will also be featured this year’s Ontario Equestrian Federation Conference Sunday November 27. Visit www.EquiMania.ca for more information on this and other upcoming events.